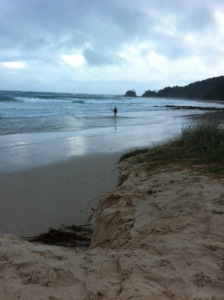 Those of you who know Byron Bay, and in particular The Pass, might be interested to know that the recent storms have changed the beach. The large swell has sent waves pounding into the top of the beach, washing away massive amounts of sand. There is currently about a 1.5 – 2 metre drop down onto the beach. Rocks we’ve never seen before are now exposed, so the once sandy sweep out to The Pass has some obstacles to negotiate down from the Clark’s beach deck. I’m watching the first surfers of the day make their way into the water, the birds chirp in a way that I haven’t heard them over the last few days and I wonder if it signals the weather change we have been waiting for. I can even see a break in the clouds and some blue sky.